It’s interesting – I always used to like Apple, and the main thing that made me like them was the aesthetics of their machines: there was something a little more personal and attractive about them. It isn’t that the machines have become less attractive, or that they don’t have a little bit of a design edge over the usually pedestrian PCs that are available, but, as I have said elsewhere, something hit a plateau as far as new and interesting ideas. Constant novelty isn’t what I am thinking of or wanting, and I think most people get burned out on that, but perpetual tweaks to existing things smacks of the whole game of constant updates to systems that should already work. 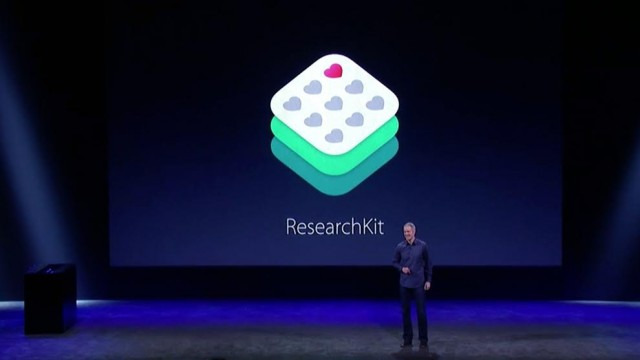 So, Apple’s ResearchKit is maybe that interesting thing that I have been looking for from the house of Apple. It promises to make a lot of medical data about the owners of iPhones available to researchers the world over, and Apple’s encouragement of new applications that can take advantage of the hardware promises to open up the field quite a lot. This might make all the wearables that seem to be where it is at at the moment, that bit more relevant. More than 60,000 iPhone users have enrolled in the first weeks of its launch, according to Apple, which is a pretty big amount of sample data, an amount that is sure to get some of the other companies, such as Fitbit, in the biometric device market a little itchy, to say the least. Their Worldwide Developers Conference, which encourages the development of applications in IOS and the Mac is bound to bring forth some useful innovations. Could this be the game changer for health that the iPod was for music, and that the iPad was for personal computing? Personally, it speaks to me more than the watches, but that could be just me. Some people will buy anything if it has an apple on it. The public relations and advertising opportunities of something like this – something that could help improve the health of a lot of Apple customers, and then exponentially anyone who the gathered data is relevant to, has to be more valuable than a smart watch. Is the next forefront? A way to go forward from where Jobs left them? Whatever they do generates interest, and their stock value means they have to be doing something right, but this really does seem to more in the spirit of what Apple is and should be about … breaking new ground.